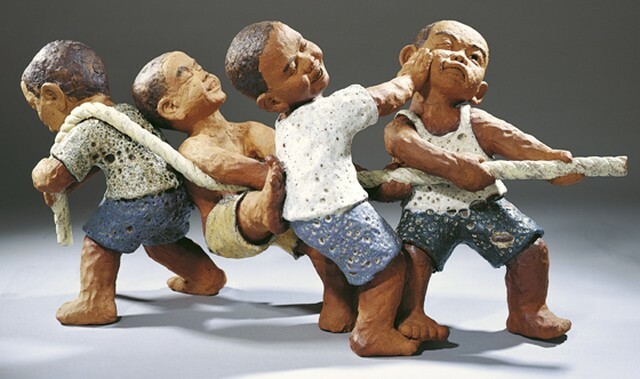 When first seeing Li Jin-Sheng’s pottery sculpture, the impression was some little boys with sentimental scalps and dirty undershirts, some of them were still hanging half a foot across at the seesaw. The moment brought the viewers as if back to the elementary school’s small campus in the vivid hubbub of the class scene. Then the little girl’s short hair and uniforms accompanied by the cute kittens squatted next , or the reaching distance, these were the elements patterned like Hayao Miyazaki animation. They easily captured the eyes of viewers, and made people smile and mood rise unconsciously. By means of team moves, highlighting the momentum between the pulling bodies throughout the rope, the visual area of the continuous expansion and extension symbolizes life energy performances and challenges. Four people with different expressions are metaphors and characteristics of common impression among peers, through clay’s unique qualities, the work created honest, opportunistic, stubborn stereotypes and shy timid various patterns. With children’s innocence, it further humorously satisfies people’s curiosity leading to a traction of feelings and re-reflection of human’s desire, anger and ignorance.